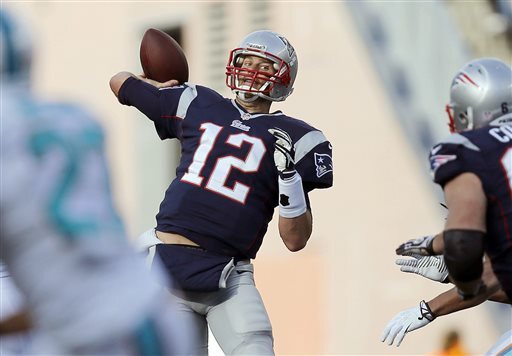 The New England Patriots shook off a dismal first half and another mediocre performance by Tom Brady to beat the Miami Dolphins 27-17 on Sunday. Trailing 17-3 after gaining just 59 yards in the half, the Patriots quickly turned the game around in the third quarter with two touchdowns in a span of seven plays. The Patriots (6-2) outscored the Dolphins (3-4) in the third quarter 17-0. Miami lost its fourth straight game. Brady completed 13 of 22 passes for just 116 yards, but threw a 14-yard touchdown pass to Aaron Dobson with 6:32 gone in the third quarter that began the comeback.